I also eat them when I’m happy so let’s call me a Gemini and be done with it. Eating while in the throes of grief has been a surprising journey for me as a human and especially as a food blogger. I’ve craved beef – I never crave beef. I wanted pre-packaged noodles despite remembering that Maggie noodles have always made me feel like I have a brick sitting in my gut. Nissin Top Ramen, doesn’t. I boiled vegetables just to eat vegetables. I ate canned beans with warm Goya rice, shredded cheese, and lots of avocados (my father was very much in love with his avocado tree, so that might have something to do with it + BEST MEAL EVER). I hated the act of cooking and cleaning up after. If it took no effort, I was in. Some of these feelings haven’t gone away completely. A part of me feels like I’ve become comfortable with not trying to cook but I have to remember I went through something where I couldn’t stop thinking about something else. That something made/makes me not want to take care of myself, even though I should. If this is you, know that all of this is normal. It requires dragging yourself up and eventually through the power of practice, you won’t just be surviving. I have a lot of experience boiling potatoes and eggs. The two things together can make a wholesome meal when you don’t really want to try too hard. If you’re depressed or grieving and don’t want to cook, this recipe comes together quite easily and makes a great 1 person meal for at least 1.5 days. It’s kind of festive-looking too, right? I hope to have more of my happy-making sad person foods in recipe form soon. Not only were they delicious, they really saved me. Food is a celebration, yes but it’s also a basic need. I might not have had the ability to blog last year but did I ever learn so much about how to feed myself. If it helps even 1 person in the process, I’ll be grateful. If you’re making this recipe in India, use about 5 potatoes to make this. The green onions can be replaced with spring onions but only use 1 from the bunch. The avocado sauce is very adaptable so you can use vegetarian/eggless mayo if you’re vegetarian. Change up the herbs based on your taste. As for the other half of the avocado that this recipe does not call call for, you can add it to this salad as a option. 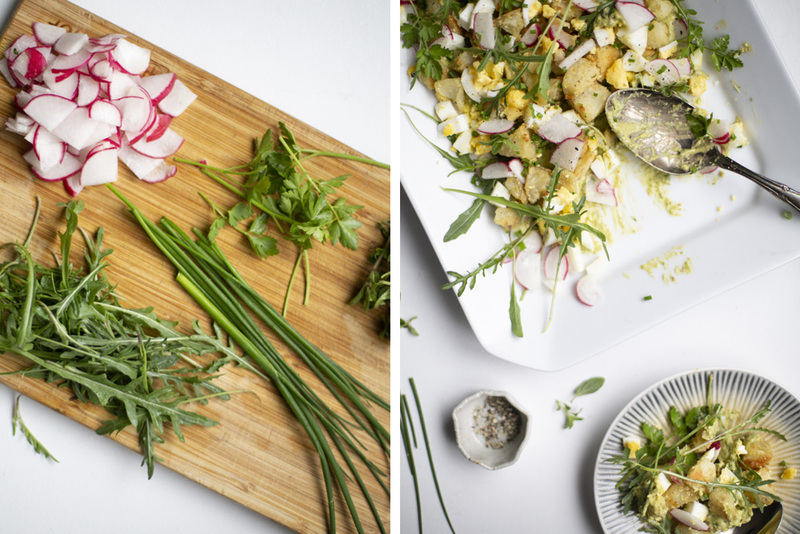 Apart from lunch and dinner, this makes a great breakfast salad with toast too. Heat the oven to 400F/ 200C. Cover the potatoes with water and salt and boil the potatoes until you are easily able to stick a fork right through them. Once that happens, carefully remove the potatoes from the water and place them in a strainer or colander and pour cold running water over them to help them stop cooking. Peel the potatoes (or not – this is a personal preference) and then dice them into bite-sized pieces. Put the pieces in a bowl and then using your hands, rough up the potatoes as if you are mixing them. They should have a shaggy appearance and it’s okay if they don’t have a perfect shape when you’re done. Taste then, season them with more salt and white vinegar (if using). Lay the potatoes on a baking sheet and place them in the oven. Roast them for 30 minutes, stirring them at the halfway mark, until they have plenty of brown bits and bobs. Use the same potato cooking water to boil the 3 eggs. Replenish some of the water in the pot if you think it won’t completely cover the eggs. Bring the water to a boil again and lower the eggs into it. Cook for 10 minutes and the drain the water. Run cold water over the eggs to stop them from cooking (just like the potatoes). Once cooled, Peel the eggs and then dice them (how big, is up to you). 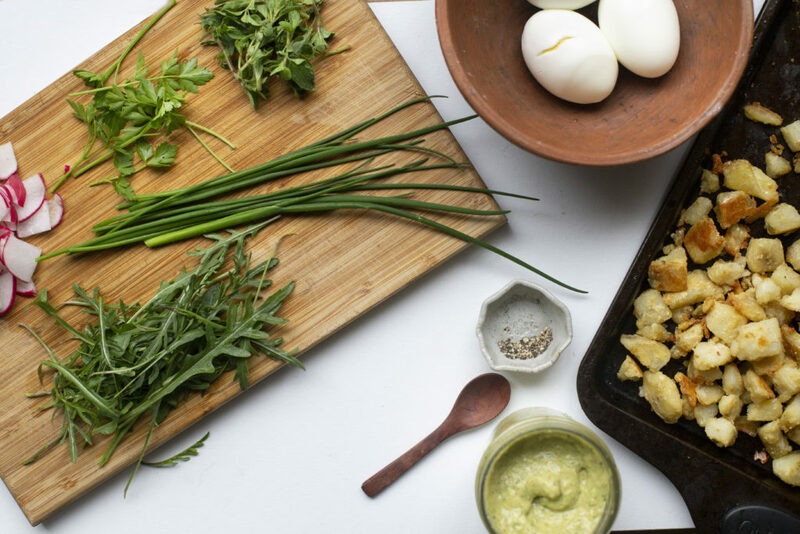 To make the avocado sauce, place the avocado, green onions, garlic, 1 cup of herbs, mayonnaise, mustard, olive oil, apple cider vinegar and lime juice in a blender and blend until everything is smooth. Add salt and pepper to taste. 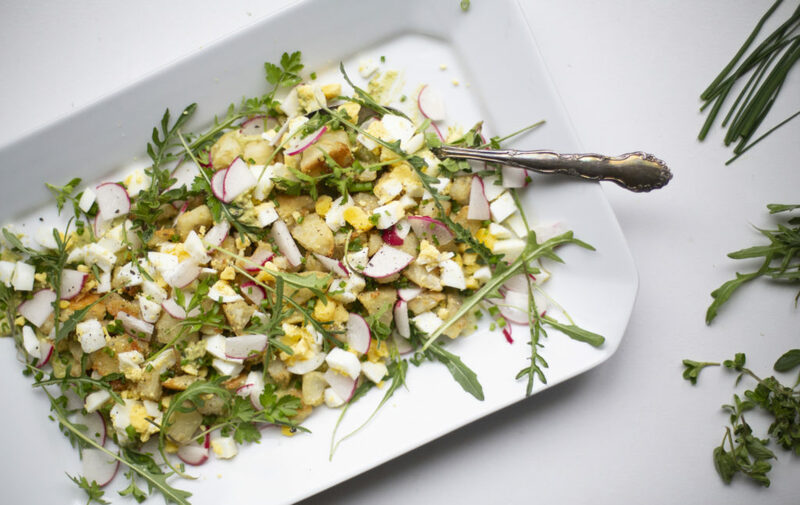 To assemble, place the room temperature potatoes, eggs and radish into a bowl and toss them lightly with a spoon. Spoon desired amount (I used a lot!) 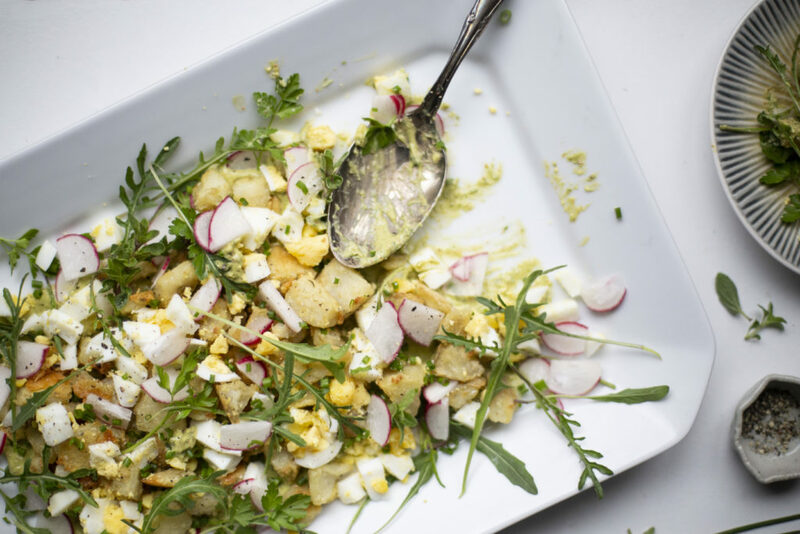 of the avocado sauce on the bottom of a serving platter and spoon the potato-egg-radish mix onto it. Toss in the arugula (or desired green) and garnish with 1/4 cup of herbs, roughly chopped. Taste and add more salt/ pepper or avocado sauce, if desired. I love what you said about food being a basic need. Food as celebration is an overused trope. Sometimes we just need to eat a tasty meal and continue to feel our feelings.